So, anyway, I was having tea the other day (as one does) with a certain unnamed source at Nkandla (lovingly refurbished and upgraded by you, the caring taxpayer) and during the course of the conversation, we got on to the topic of how hard and boring it is to be the man at the top (as one does), how no one really respects me anymore, as it were and that I feel that I may have lost my purpose and/or moral compass. It was decided that I needed to rediscover my sense of self, my well-being, my happiness. And what does one do to make one’s self feel better? You pick on someone and bully them! The selection of the candidate was rather difficult, simply because we started at the end of the alphabet (ignoring the Z’s for obvious reasons) and randomly chose V, as one does, to avoid a lenghty debate over appropriateness. And whose surname starts with a V? I made some calls, but have since discovered that Brett Kebble is dead, China Dodovu has a prior engagement and Glynnis Breytenbach is no longer talking to me. So we were left to spreading rumours and allegations, like high school girls at break time. Things like financial irregularities, handshakes in darkened doorways, black bags of cash. None of which we have any evidence for, of course. But now things have gotten out of hand. Completely. This thing, this candle, or whatever it is, I found it in my desk drawer, ok? 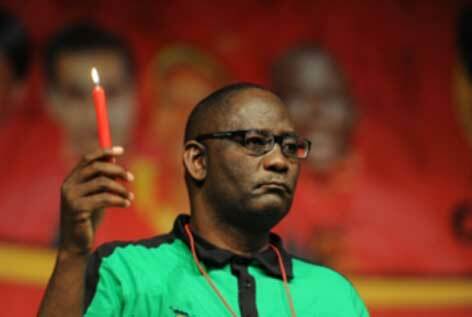 Vavi is saying he knows who is out to get him. He is vowing to fight this fight, which fight is not really a fight, but rather a fight over who is the bigger boy on the playground. I have lost the joy again, that initial rush of happiness and now I need to do something else to make me feel better. I know, I am going to do some therapy shopping. Nkandla needs a new tv room! This entry was posted on Wednesday, March 6th, 2013 at 05:57 and is filed under Lessons in Dictatorship. You can follow any responses to this entry through the RSS 2.0 feed. You can leave a response, or trackback from your own site. One Response to Who’s your Daddy?